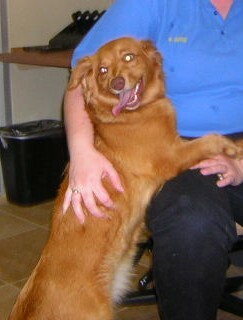 We were notified that Karma was in Flower Mound, in a shelter, just north of Dallas on March 25th. Cynthia Parker, who lives in Flower Mound, went and checked on her immediately, verifying that she was a Toller. Debbie Lhotke at the Flower Mound shelter called us as we were prepairing to leave for Dallas. She said that the lady who had tested Karma was tremendously impressed with her and wanted to develop her into a service dog for the deaf. She just wanted Debbie to foster her for a couple of week to see if her confidence could be improved. Debbie asked if we could put off picking her up and give her this chance. We agreed. Debbie called back on April 20th and said that Karma had failed her test again. So the next weekend (April 22-3) we drove up to Flower Mound and picked up Karma. 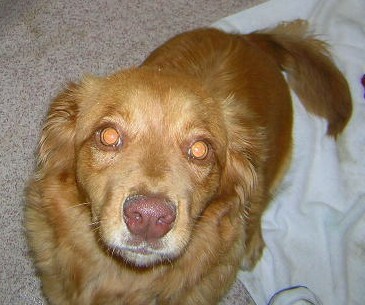 Karma's configuration is typical of a Toller. She looks almost exactly like Judy Hrncir's dog Cady. She appears to be about nine months old. Her paws are still a bit large for her body; she is still mouthing everything like a pup. She is filled with energy and moves constantly. She seems to have a very strong retriever instinct; she will fetch and bring anything you throw for her. Karma has a brown nose and yellow eyes. She has dew claws on her back legs which hang by the skin. Her fur is extremely soft, almost like a rabbit. She is good with other dogs and children. She is relatively good with cats. She wants to chase them, but doesn't do anything except look at them when she catches them, or they stop running. She is great with strangers; she loves everybody. She probably won't be a good watch dog for that reason, although she does bark at anything that comes into the backyard. Karma loves to bark, even in the house (we are working on that). She is also a digger; she tries to take every chew toy outside and bury it. She also howls when sirens go by. She loves squeaky toys. She will carry them around squeaking them. She also loves chew toys. In fact, she really needs lots of chew toys since she is still a puppy. Karma is current on all medications and is heartworm negative. We had her altered and gone over by the vet on April 28th. Karma is learning to be quiet when we are reading or taking naps. At night I still have to crate her because she will get up in the middle of the night and start playing--usually with whoever is on the bed. Karma is good at taking baths and seems to positively enjoy having her teeth brushed. She also loves being hugged. She climbs into your lap and lays her head against your neck and just cuddles. She loves being with people and loves being touched. We have started clicker training Karma. She is good at "sit", and learning "down" and "touch." She is responsive to "come," but if destracted, will come only with kissy noises. We will start her on heeling and staying soon. She is very responsive to training. Karma is very alpha. She spends a great deal of her time on top of Amy pushing her down to emphasis her status. She is getting much better with the cats and largely ignores them. 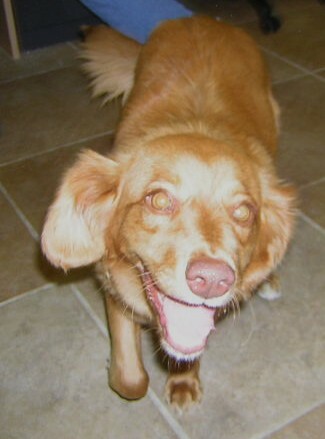 She plays very well with Amy, the other Toller. She is very sensitive to criticism. I raised my voice when she started to run out the front door and she peed a little on the floor. Clicker training and positive reinforcement are working well with her. Her housetraining is still iffy. She has had a couple of accidents and bears watching closely. I think she is still too young to fight sudden impulses. By the way, she scratches the door to go out. She is still enough of a puppy that she needs constant entertainment for her mouth to keep it off the furniture, out of the trash, etc. The best chewy toy we have found is the "Bone Buddies Rawhide Retriever Roll" Hickory flavor. This keeps her entertained for hours.